Denisse Mateo Chero serves San Diego Zoo Global in a consultant capacity as a Field Program Coordinator in Population Sustainability. She is a Peruvian biologist who plays a key role in our Andean bear conservation research program. Denisse is engaged in developing, coordinating, and implementing ecological research on wild bears in Peru, and also conducting outreach efforts. She integrates our work with that of governmental agencies, external partners, and collaborators. 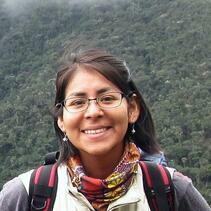 Denisse previously worked with San Diego Zoo Global researching giant otters in NE Peru and jaguars in SE Peru. She has additional experience and skills gained through other opportunities conducting population censuses of vicuñas, managing plant collections, monitoring macaws, and constructing digital databases. Although Denisse is interested in the myriad questions related to conservation of Andean bears and their habitats, she is particularly intrigued by interactions between these bears and the plants on which they depend. Denisse earned her bachelor’s degree at Universidad Ricardo Palma (Lima, Peru) conducting research on the Andean bear’s diet and role as a seed disperser in a montane forest and alpine grassland in NW Peru. She has also planned and executed a similar project at the Wayqecha biological station in SE Peru. One of her greatest skills is her ability to work effectively and amicably with diverse teams to better understand and conserve Peru’s natural resources.